The Lost Formats Preservation Society [^] was formed to save dead and dying media formats from obscurity. It is an incomplete collection, with silhouettes and a brief history of each format featured. The versatile Compact Cassette brought back some memories: cassette players mangling prized audio tapes, and waiting for computer games to load on a Commodore only to fail at the last minute. Ah, those were the days! 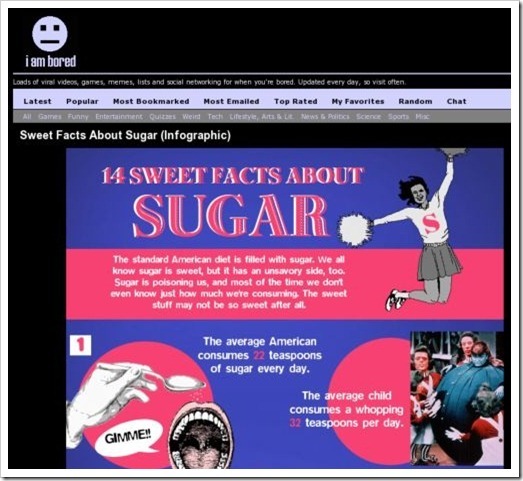 Wow, if you didn’t already know that sugar is not good the infographic “Sweet Facts About Sugar” [^] should help you change your mind. Point 10 is one of the most important: “Refined Sugar has no nutritional value, besides empty calories”. I’m so glad that I gave up sugar in tea and coffee, that means that I can enjoy it in sweets and lollies – where it’s supposed to be!